Two sample Screw-top containers have arrived from China for our approval and we are delighted with them. They were blown from a standard pre-form (blank) into a mould designed for us by our packaging partner PI Global. The mould was made in China from a digital file sent by PI Global to the mould maker in China via the company here in Zambia (Polymer Containers Limited) who will be producing the Screw-tops. The machinery they use comes from China and so China needed to manufacture and supply the new mould. 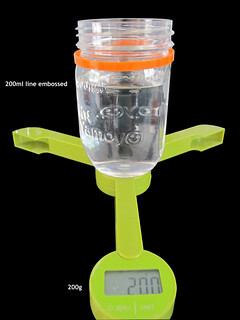 A crucial feature of the design is that can measure 200ml of water so that mothers can accurately measure the water needed – 200ml – to mix the ORS contained in the kit. As you can see the sample passed this test with flying colours – 200g exactly! The mould will now be air freighted to Zambia. We are in a hurry as the original AidPod containers are running out. Meanwhile, 2,000 trial (final prototype) Flexi-packs from Amcor are clearing customs. We will be giving feedback on these once in our hands so that they can go into production too. 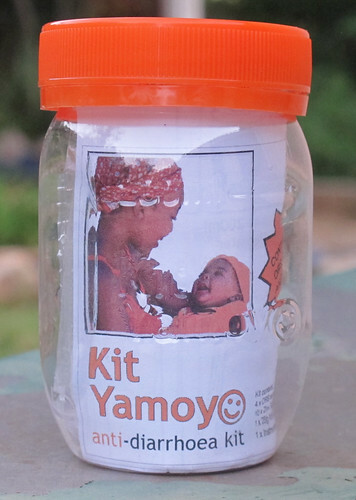 The Screw-top and Flexi-pack will be the two formats we will use in the national scale-up in Zambia.